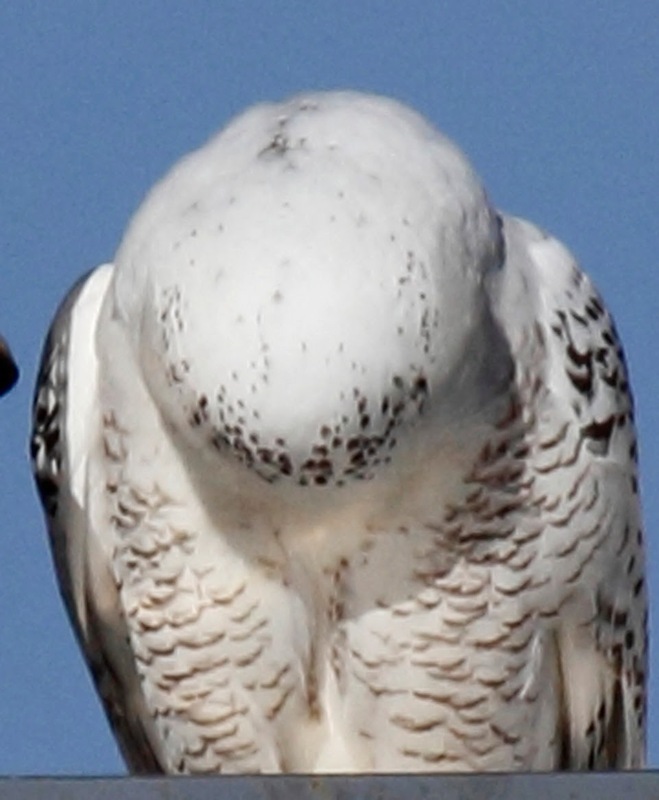 Another Snowy Owl sighting by yours truly - 2 Snowy Owls actually. 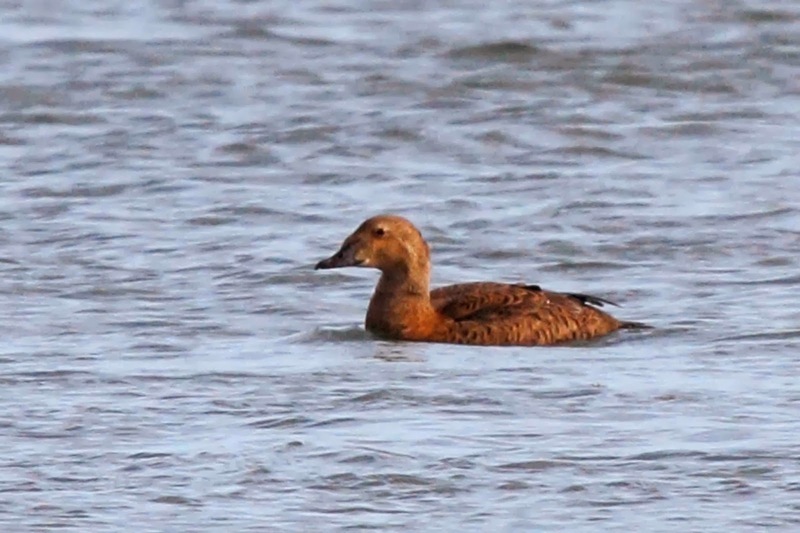 The first sighting was on Saturday at the Northeast Philly airport. I took Connie up there so that she could get her "Lifer" Snowy Owl. The owl was not visible from the soccer fields so we drove up to the police station and looked into the airport from that angle - and sure enough, we spotted the owl crouched behind a blue tarp in the middle of the field. No photo to show you on that one since it was so far away and too windy to get a photo. We did call our friend Phil so that he could come up to see the owl. 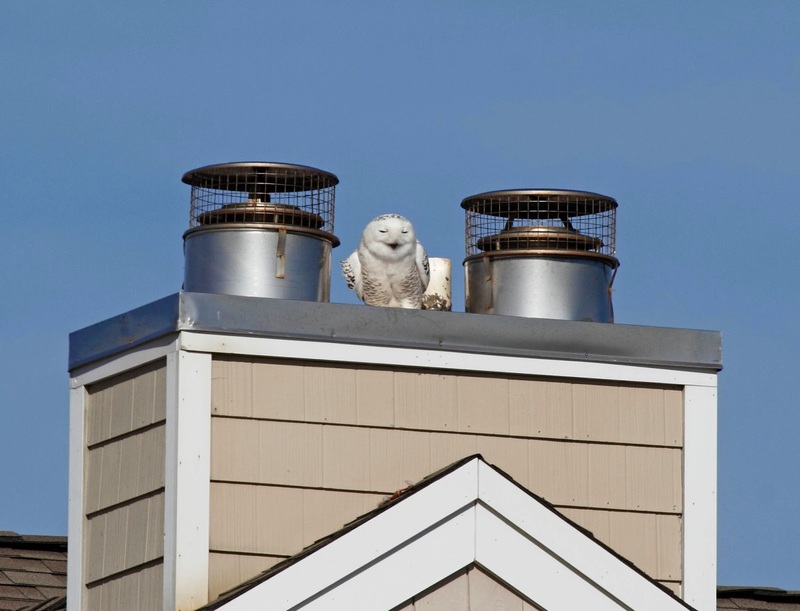 A "Lifer" is always good, but that view of the Snowy Owl was not very satisfying for Connie. I could tell by her reaction especially since she has seen my photos of other owls (take a look at previous posts). Not to worry though. We got her a better view of one on Monday in Cape May. Take a gander at these photos. Now THAT'S a life bird. The first photo shows you where he decided to perch to eat a seagull for lunch. The Seagull guts are actually splattered on the peak of the roof just below the owl. Thankfully, we arrived after lunch. Here he is looking down off the rooftop. This is a 3 story condo unit right along Beach Ave in Cape May. I wonder if he has ever perched that high before since there are no trees in the arctic. Here he is preening his chest feathers. I thought this was an interesting view of the top of his head. And yes, the experts think this is male due to the fine barring of the feathers on his chest and the clean white top of his head (not alot of dark markings). It was 50 degrees in Cape May yesterday. Seemingly too hot for this guy. 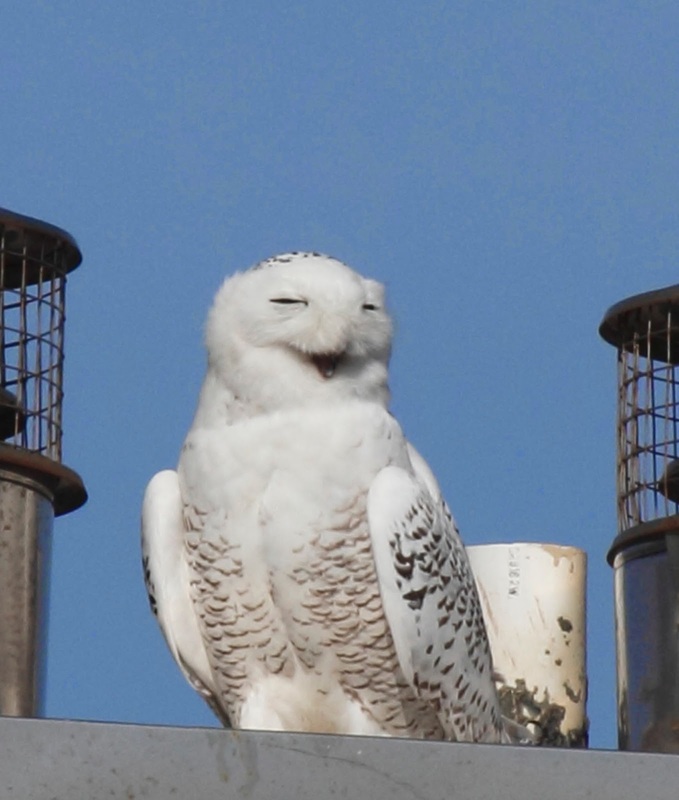 He sat on the roof and panted like a dog most of the time but it looks like he is laughing at a really funny joke in this photo. In case you are counting - these were Snowy Owl numbers 7 and 8 for me this winter. Who would have thunk it? I took a quick run over to Nummy Island to see if I could get a few photos of the 2 female King Eiders that I saw there on Sunday. The photos that I took on Sunday were literally some of the worst shots that I have taken in a long time. These are a little better. Handsome in their drab brown. The 2 of them would hang around under the bridge, drift out on the tide and then fly back to the bridge when they got too far away. 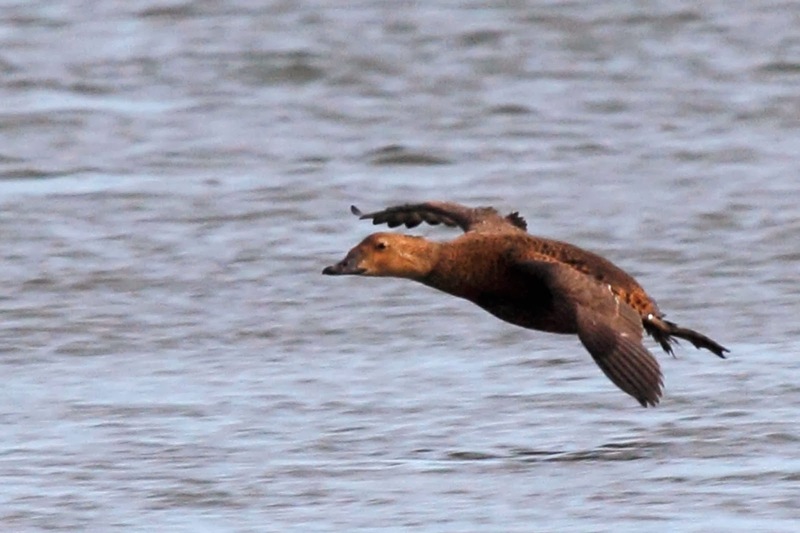 Here is one of the Eiders flying back to the bridge. I hung out on the rocks next to the bridge to try to get a closer view. We stayed at Biggie's overnight on Sunday so that we didn't have to unwinterize our own house. A few other people stayed too. We took them over to Cox Hall Creek to see some Redhead ducks. We were not disappointed. 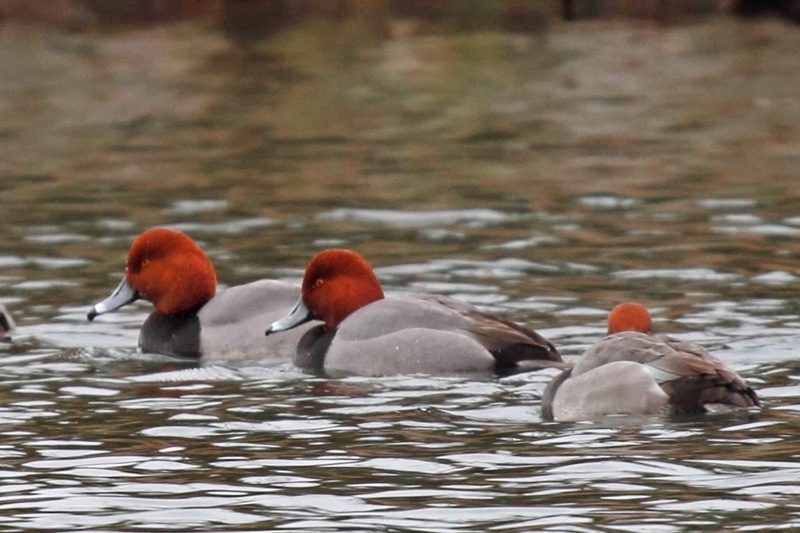 You can tell why they are called Redheads from this photo. Gorgeous! The girls should have gone to Cape May with us to see the owl. I think they would have been flabbergasted. What a really great day! You might have a bit of trouble spotting the owl today. Enjoy your time off. Hi! 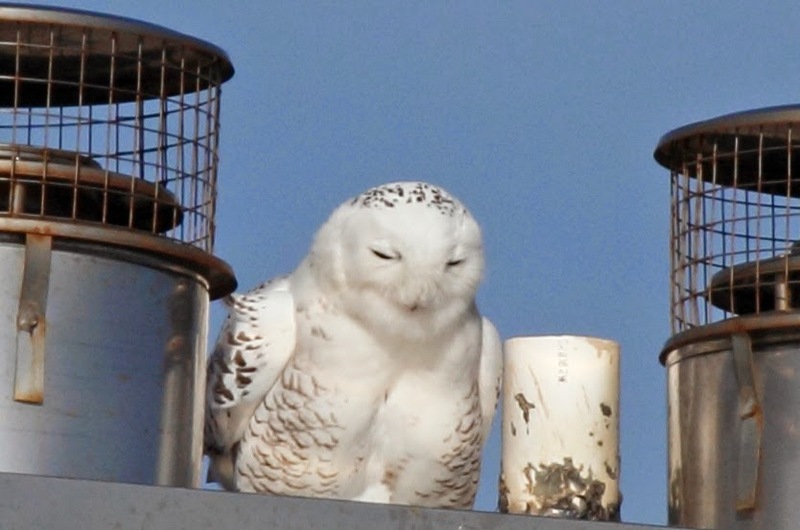 I found your blog after searching for snowy owl sightings in Philly, and I'm wondering if you could give more details about where you have been able to spot them in the city. Northeast Philly airport looks like a good bet, but I'm not sure where exactly I should park (street/intersection?) to get a good look while avoiding trespassing. Also, do you typically look for them in the middle of the day?